Fool for Love (1985): I’ve got some attachment to this script, having produced a production of Sam Shepard’s original stage play some years back. Altman’s film version (adapted by and starring Shepard) is a bit of a slow starter, with ten+ minutes before any actual dialogue; Altman uses that time (well) to set a palpable and particular mood. 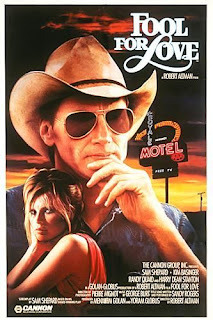 His visual additions are mostly successful—the additional, unexplained ghosts wandering through the background are effective, and there’s a bit more of the Come Back to the Five and Dime mirror play, particularly in one magnificent shot where Shepard’s Eddie is seen through a motel window, looking in at Kim Basinger’s May, and the window reflects for us what he sees (her in the bathroom, watching him). In that shot, and in a remarkable scene where she merely pulls of a sweater, Basinger has never been sexier; she’s also never been better. Shepard is, of course, brilliant; no one knows this character better than him, and he’s incapable of a false note. 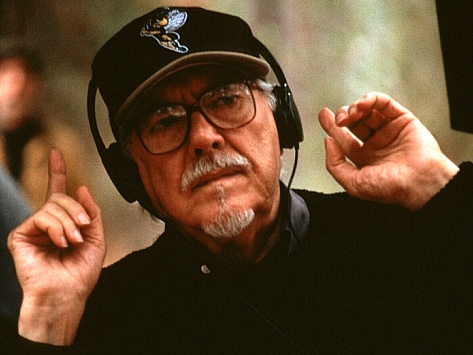 Altman enhances and respects the text, but doesn’t treat it as sacred. Instead, he distills the piece to its powerful essence. REGULARS: Basinger returned for Pret-A-Porter (aka Ready to Wear). Basements (1987): In what must have been his greatest sell job (and that’s saying something), Altman convinced ABC to air this film adaptation of two Harold Pinter one-acts as a TV movie. The first, The Room, is the lesser of the two, a strange (though well-acted) chamber piece. 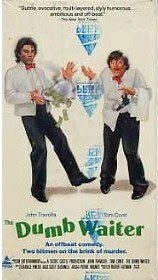 More successful is The Dumb Waiter, featuring John Travolta and Tom Conti. Again, it’s fun to play What Did It Influence, since Prism Entertainment released each half under its own title on VHS (with the woefully inaccurate cover art to the right—the title refers to the small freight elevator that plays a part in the tale, not a dumb person who is a waiter, as Travolta and Conti are drawn to wackily be). I can’t imagine Tarantino didn’t see the film, since it features Travolta as one half of a hit-man team, making idle conversation while waiting to do a job. It’s a little jarring to hear a Cockney accent coming out of Travolta (and the accent itself is pretty dodgy), but he and Conti are both quite good. Both films are occasionally ponderous (as Pinter can be), but also fascinating (as Pinter can also be). Neither film looks or plays much like an Altman picture, but this seems to speak to a real respect for the text, and a desire to stick very close to it. 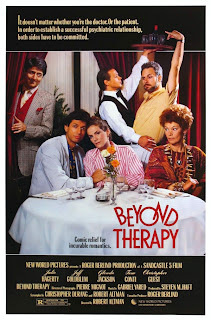 REGULARS: Conti reappears in Beyond Therapy (below). ALTMAN’S AMERICA: Both stories take place in England. 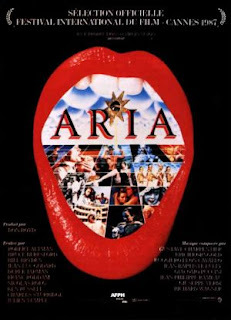 Aria (1987): All right, you got me: due to the time constraints of The Altman Project ™, I did not watch Aria in its entirety. This omnibus film gathers ten directors—including Altman, Jean-Luc Godard, Ken Russell, and Nicolas Roeg—and gives them each an aria or scene from an opera to use as the basis of a short film. Several of them (I did jump around a little, and may have watched the segment where Bridget Fonda gets naked) use the music as accompaniment for a story. Altman, ingeniously, uses the opera as environmental music—his film takes place entirely in the audience of the Ranelagh Theater, an audience filled with inmates from an asylum. It runs seven minutes and is pretty clever, though clearly of no use for this project. 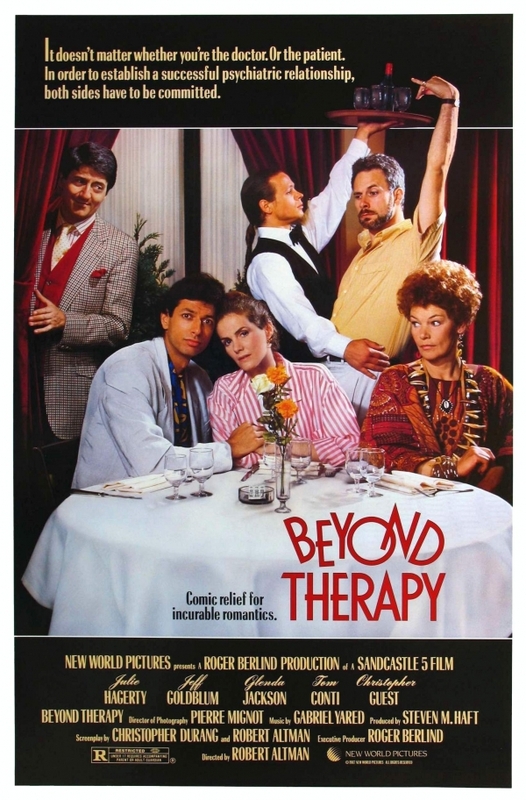 Beyond Therapy (1987): This adaptation of Christopher Durang’s stage comedy is—with Quintet and O.C. and Stiggs—often brought up in discussions of Altman’s worst film. I found it far better than either of those, but it has one major, gaping problem: his filmmaking style is a terrible fit for Durang’s script. As in Fool For Love, he takes his sweet time getting to that famous opening duet (anyone who’s done high school forensics can probably recite it, whether they ever performed it or not); as in the Shepard film, he’s setting the table for the film. But his style is too casual and detached for the absurdity of Durang’s scenario and dialogue. He clutters up that first duet with outside action and cutaways; he shoots the very funny therapy scenes literally through a window. His approach is just plain wrong for this material, or for anything resembling straight-forward comedy (to watch it is to better understand why O.C. didn’t work either). There are some good things in it: Jeff Goldblum and Julie Haggerty are perfectly cast, Glenda Jackson’s arid-dry line readings are exquisite (“Who’s Bob?... I though you were someone else this whole session”), and Durang’s dialogue—when it’s just done—is often very funny. But, in contrast to most of his other mid-level pictures, the film works in spite of Altman rather than because of him. REGULARS: Small roles in California Split and Nashville were among Goldblum’s first credits. Haggerty is credited as appearing in Altman’s Aria segment, but damned if I could spot her. ALTMAN’S AMERICA: Not much, aside from the same kind of vague satire of Reagan-era economics and sociology that O.C. and Stiggs tried. Vincent and Theo (1990): So this was kind of the comeback before the comeback—Altman’s first film in years to get positive reviews and turn a profit in arthouses, leading to his real comeback two years later with The Player. 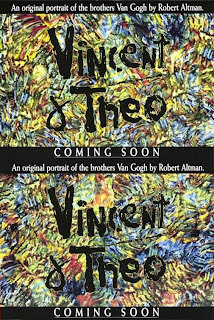 He keeps his excesses in check here—it’s a quiet, intimate, disciplined picture, gorgeously shot, well-acted (particularly by Tim Roth as van Gogh, complete with very period teeth). It’s also dull as toast. It reminded me somewhat of Scoresese’s Age of Innocence; when directors like these do this kind of period drama, I’m impressed by their versatility, and I respect their need to show it. But in making them, they end up suppressing what makes them such exciting filmmakers. I see why so many people like the film—it’s just not my flavor of vodka. Robert Altman’s Jazz ’34 (1996): Here’s what happened: in 1996, Altman made Kansas City, a jazz-infused tale of small-time gangsters in Prohibition-era Kansas City (Altman’s hometown). He used an extended jazz jam as counterpoint to the action, cutting away and underscoring with an all-star band of jazz musicians; it’s clear, when watching the film and analyzing his technique, that he just shot a shitload of performance footage and then used it as needed. Jazz ’34, which aired on PBS’s Great Performances in 1997 and was released on VHS, is basically a compilation of those music scenes, uncut, with “rememberences of Kansas City swing” interspersed in voice-over in-between. It’s a treat for jazz fans, and a lot of fun for everyone else, but there’s not much to say about it. I’m down to the wire—only two full-length films left, but I’ve also got the two iterations of the Tanner series to work through this week (and those, concerning a political candidate, should have plenty of fodder for The Altman Project ™).